Stills from the documentary Road to the Wall (1962). An edited version of the documentary was broadcast as an episode of The Big Picture during its 1962–63 season. The events of what became known as the Berlin Crisis made world headlines and were widely covered by the press in the United States, including the news divisions of newly-established television networks. 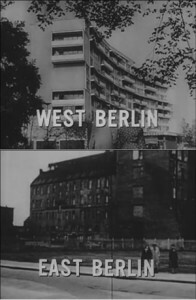 In programs such as “The Tunnel” (1962), episodes of the US Army series The Big Picture (1951–64), and the news special “The President at the Wall” (1963), all three major networks covered the Berlin Crisis and all showed a strikingly similar image of Berlin. In this image, the divisions that crossed the city—economic, political, social, even moral—are clearly manifest in its built environment. The prevalence of this motif raises several questions. How did this depiction of Berlin’s division come to be reported so widely and, crucially, in such a consistent manner by both corporate and government media organizations throughout this period? Why was this view of divided Berlin and of the Berlin Crisis accepted as credible by the majority of the US viewing audience despite its inaccuracy? 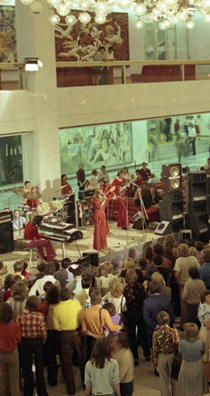 And, finally, how did the recurring image of International Style buildings in these television news programs influence the growing condemnation of architectural modernism by critics such as Jane Jacobs, which began just as the Berlin Crisis was waning? I propose to answer these questions in a digital publication, using the Berlin Crisis as a focal point for an in-depth analysis of how the simultaneous evolution of Cold War political rhetoric, of non-fiction mass media, and of architectural modernism in the 1950s and 1960s were all mutually influential. In doing so, I ask: what was the role of architecture in filmic and televisual accounts of the Berlin Crisis and, consequently, what influence did politics and the mass media have on the evolution of architectural discourse from the 1950s through the 1960s?